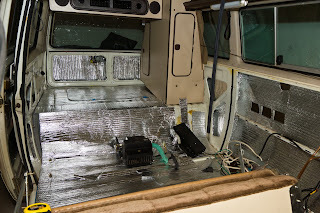 This photo sums up my weekend, picked up a roll of reflectix insulation from Lowes and fitted it to all panels except for driver and passenger floor. Way too much fun to do and surprisingly easy too. It is supposed to insulate but my goal is to reduce radiant heat from motor and sun, from what I've been reading the most important part is to insulate is the fridge panel. The fridge is in my living room right now plugged in and running, I want to run it for a few days to make sure everything is working and to do some of the common mods like the more powerful fan and interior cooling fan. 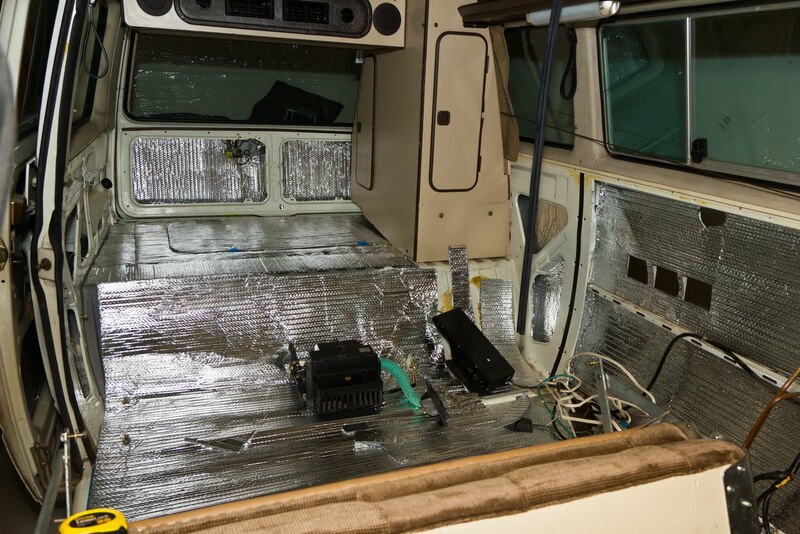 More reflectix will be added to front floor to reduce heat absorbed from radiator. Tempted to make a full set of window covers out of this stuff. The other important project this weekend was taking the bench and seats out at a car wash and power-washing them. I scrubbed them down with fabric cleaner then went at it; they sat on my porch in the sun all day to dry but will need another day or two for the foam to be totally dried out. Looking good! Next major project will be some bodywork, the dreaded kitchen rust is there but edge seams look to be in good shape for the patch panel, the slider and rear arches will be getting new patch panels as well. The previous body work was amazingly bad; instead of pulling dents and hammering it out it was covered up by riveting flat metal over the damage and using filler, some 3/4" thick, to smooth everything out. I removed the bad filler and found the camper propane stickers still underneath! yikes! I will be trying something new this time with the panels, instead of welding I will use body panel epoxy. Unfortunately I wont have the ability to paint a good finish coat but maybe when I return to Denver I can do that. The grey water tank is either something I build or the 45L tank from eurocamers.